Hey everyone. Welcome again. I am so glad many of you enjoyed my day #1 sneak peek projects. Today I am showcasing two more new product. The first one is called Tropical Trio stamp and die combo. How cute are these birds in this set? Great to colour. I love this set. 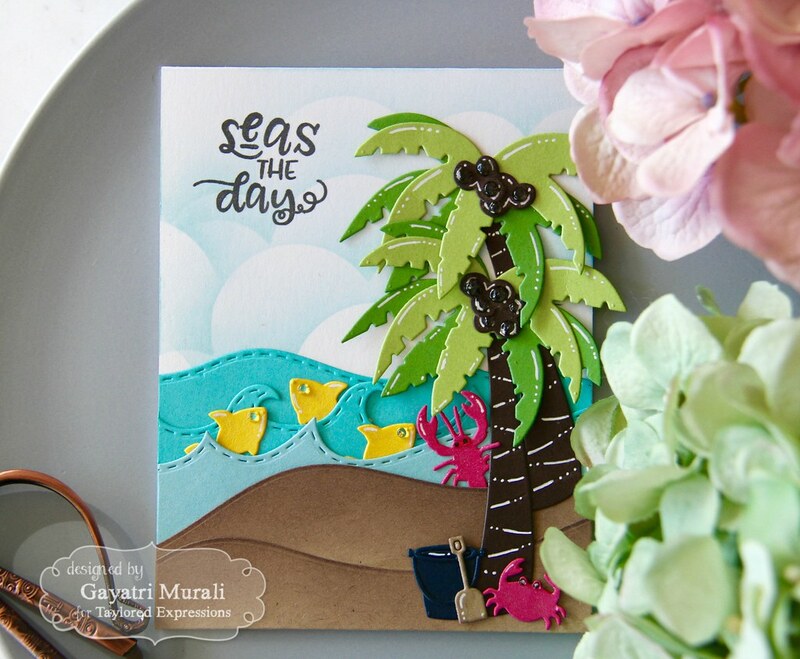 And this set coordinates well with tropical Blooms cutting plate and Build a Scene: Tropical dies. Both of these dies are new products and my project below features them as well. 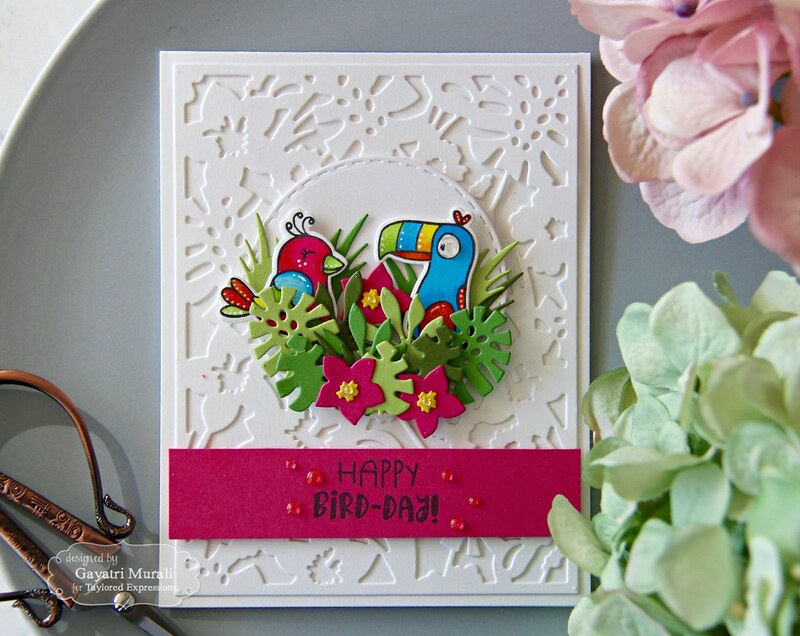 Love how the Tropical Blooms cutting plate adds texture on the background. I coloured the images from the stamp set, die cut using the coordinating dies. I also used TE Granny Smith, Peapod, Sweet Basil, Lollipop and Lemon Meringue cardstocks to die cut the Build a Scene: Tropical dies. The stitched circle die houses the birds and leaves. The sentiment on the pink strip picks up the pinks from the flower and birds and ties them together. 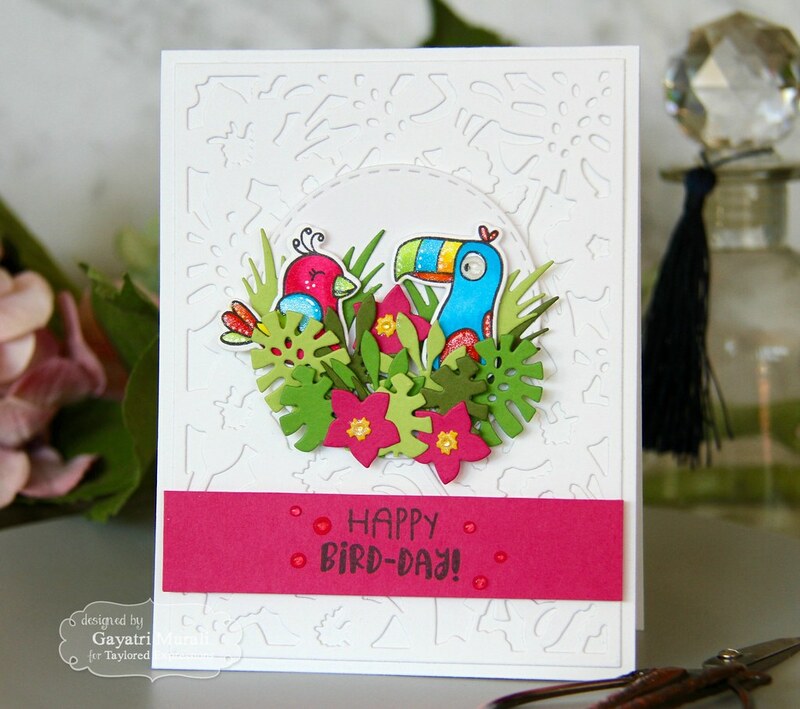 Some shimmer and glossy accent adds interest to the card. These set of stamp and die collection is a must have in your collection. Adds so much colour to your cards. 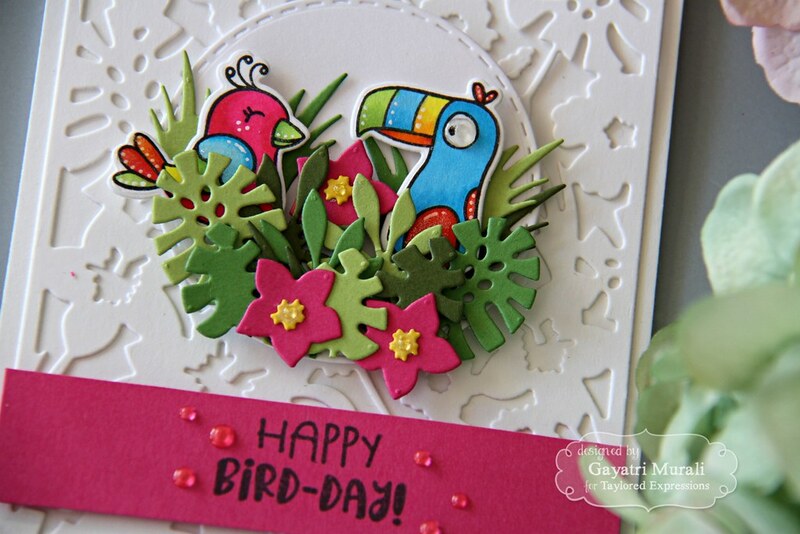 All the supplies to make this card are listed below. 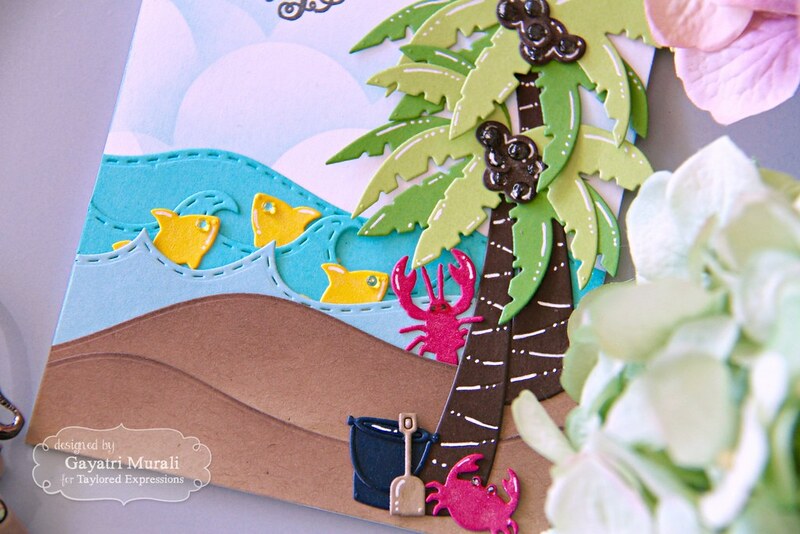 The second products I am showcasing today is another summer themed die called Little Bits Crustaceans. I combined these Crustaceans die with a few Build A Scene dies both old and new to make my scenic card. So I combined these cute Little Bits: Crustaceans dies with Build a Scene: Rolling Clouds, Rolling Waves, Rolling Hills, Tropical and Roly Poly Fish dies. This card was fun to make. Lots of die cutting and putting together a cool tropical beach scene. 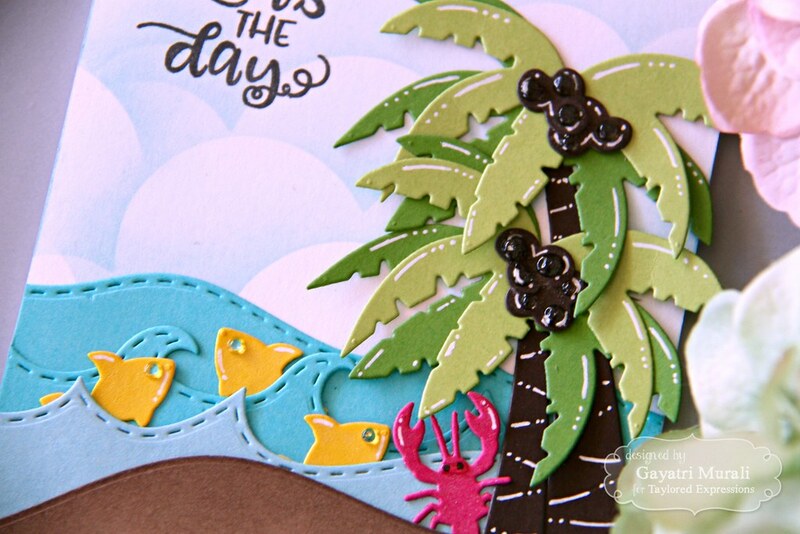 I used white pen to add highlight to the die cuts and glossy accents to the eyes of the fishes, crustaceans and coconut. 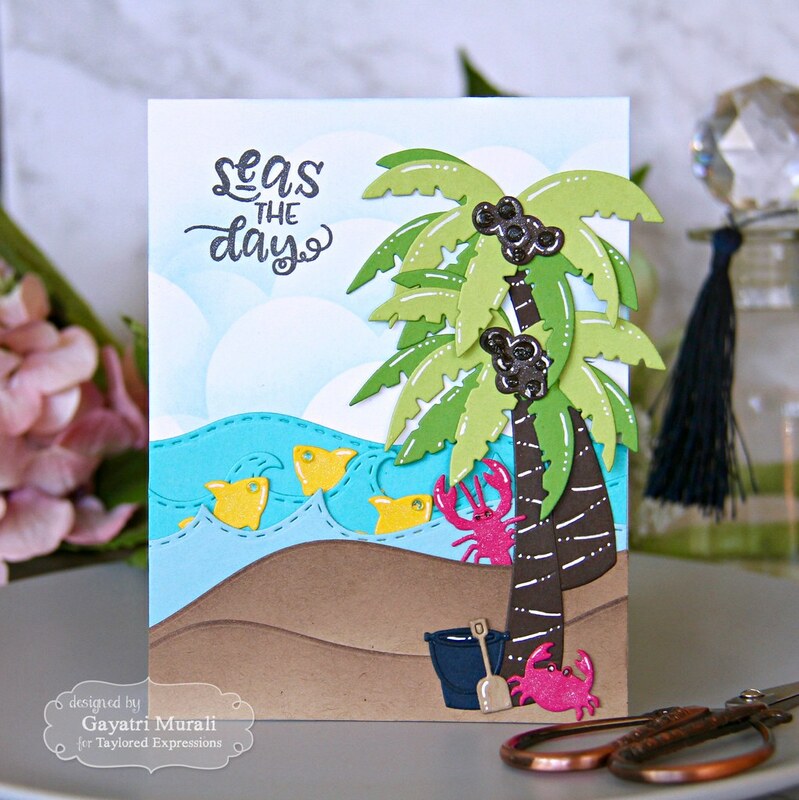 The sentiment is from Seas the Day stamp set. I used MISTI to stamp the sentiment and get clean crisp image. Check out Taylored Expressions Blog for more inspirations from other designers. I will see you tomorrow for day #3 sneak peeks. Have a lovely day! So much movement in the cards. I soak up the sun in the pool.